On Saturday, we left the Boston area and went down through Rhode Island towards Connecticut. 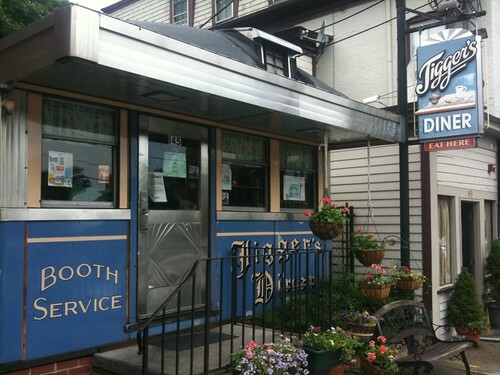 Our first stop was at Jigger's Diner, in East Greenwich. 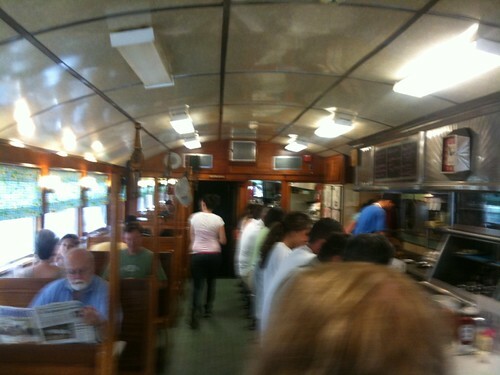 This is not a good photo, but it's the best photo of the interior that I have. 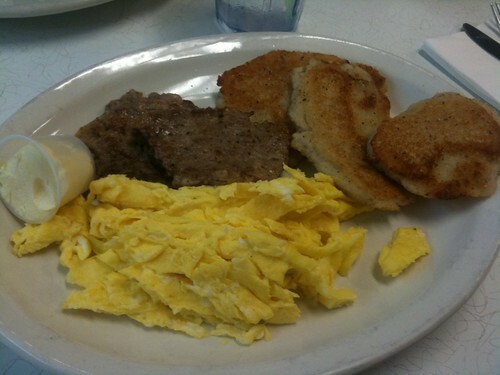 I ordered the diner-made sausage, eggs, and jonnycakes. I had expected jonnycakes to be like the cornbread pancakes I've had in the South, but these were dull, sullen globs of fried gruel, with a definite undercooked-corn taste. The diner-made sausage was just neutral, nothing to be excited about. 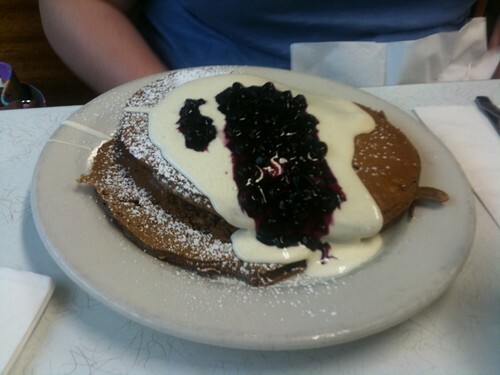 Lori ordered the gingerbread-granola pancakes with sweet cream and blueberry topping. My memory of these is that they were fairly tasty, but heavy, with a bit of that texture that makes eating a pancake feel like chewing a blanket. This is probably being too harsh on the pancakes, which weren't really bad - but it does say something that Lori pretty much ate only the portion of the pancakes that was under the topping. We had told Hallie Baker of Turtle Alley Chocolates about our disappointment in hoping for ocean views as we drove along US 1 in Maine. 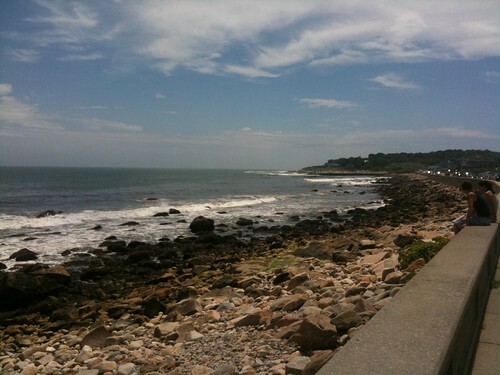 She had assured us that US 1 in Rhode Island would not disappoint us, and offer lots of ocean views. So we followed US 1 from Providence to Mystic - but unfortunately, it did disappoint. We got no ocean views from US 1. So then we turned onto US 1A, because it had a sign saying 'scenic route'. US 1A was more scenic, but I regret turning onto it in North Kingstown; North Kingstown was hosting an art festival, the street was clogged, and we were trying to make good time to Mystic. At the pace we were going, I could have walked through the art festival faster than the car - but Lori could not have done so, because her shopping is much more in depth than mine. Doing so wouldn't have helped, though, because Lori was the one who felt bereft at passing by the artists without stopping.